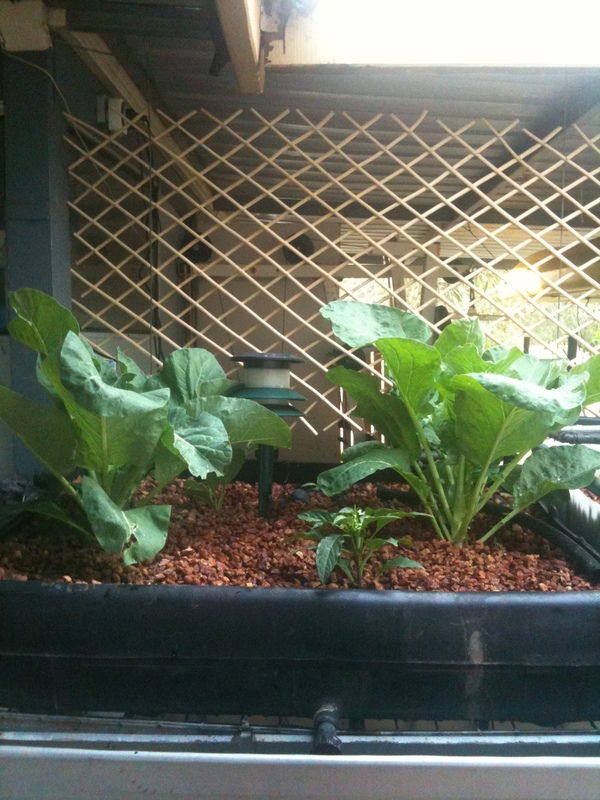 My hobby of the moment might be baking and cake decorating, but Tusk’s hobby is aquaponics, and a bit of gardening. And, since there has been some very distinct springlike weather in Perth the past week I have been shanghaied into helping. Argh sunlight! Fresh air! Not really. It’s actually been very pleasant out there. 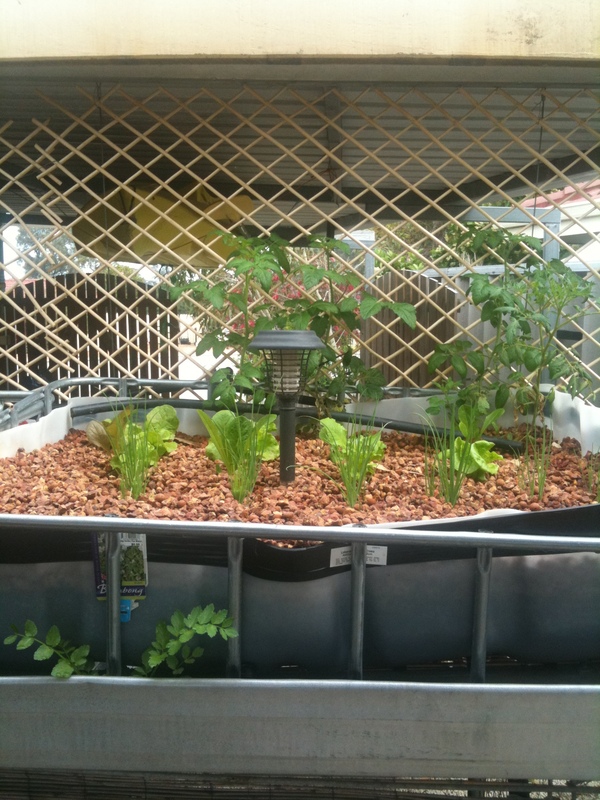 Tusk started playing with aquaponics last year after one of his workmates was talking about it. We got an abundance of vegies out of it – the usual suspects: broccoli, cauli, tomatoes, spring onions, lettuce, leek and a few herbs. But something went wrong with the water and all the fish died. Twice. So, for a while the beds were pretty bare, while he fine tuned what he was doing, and where they were best located to get the right sun and shade. And now, we he seems to have them in just the right spot. Tusk has just transplanted these from the bed at the other end, because I am going to use that as my herb garden. They seem to be coping okay so far. As you can see the cabbage moths have been feasting. The poor thing has been decimated. It turns out, mint is a natural deterrent for cabbage moths, and while it was down in the herb garden it was perfectly situated. 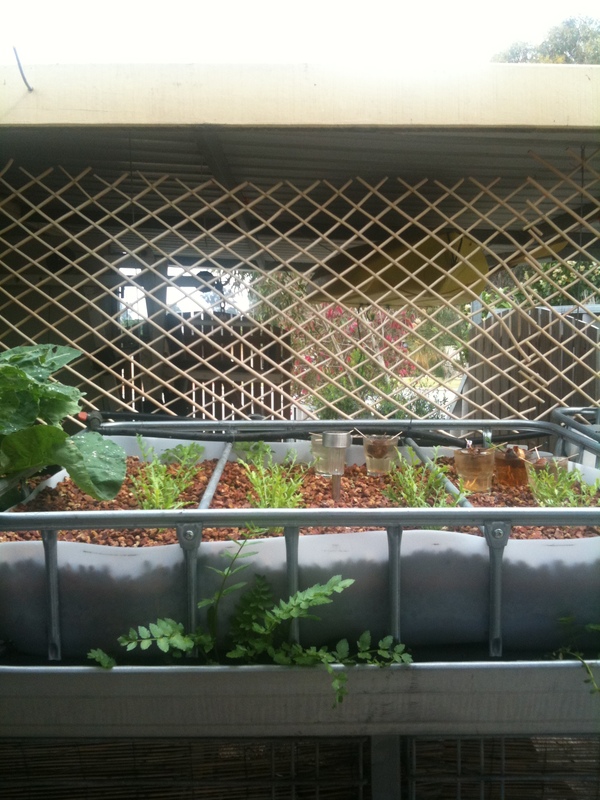 We also planted some Vietnamese Watercress and some Brahmi in the guttering at the front. Must be a good spot because it’s all growing! In the glasses are avocado seeds that I have managed to get to sprout, so they’ll join the orchard soon. Tomatoes, lettuce and spring onions. Look at the size difference in the tomatoes! 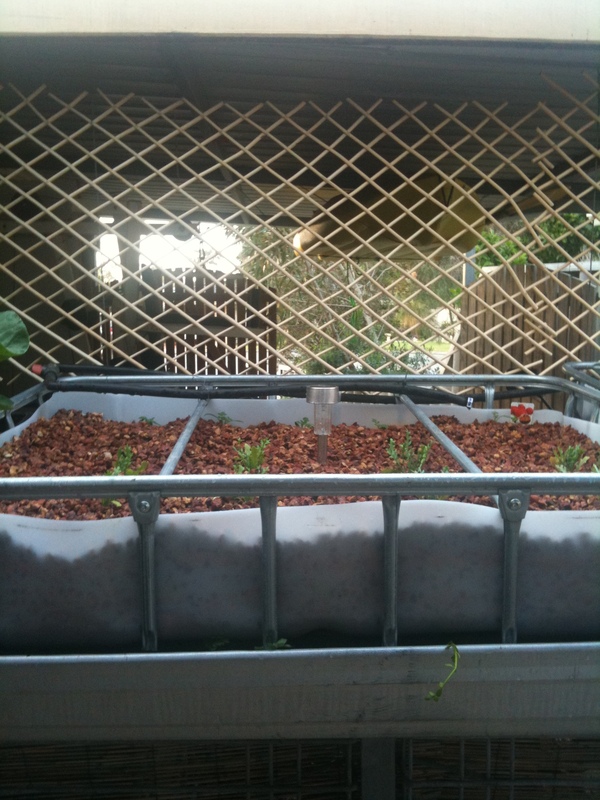 And this is the herb garden. 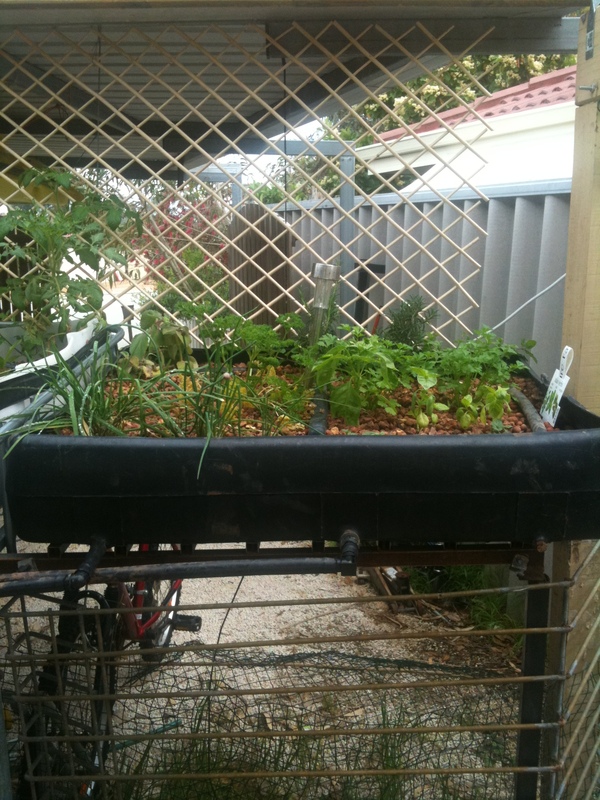 Mint, thyme, Italian parsley, basil, Thai basil and oregano. 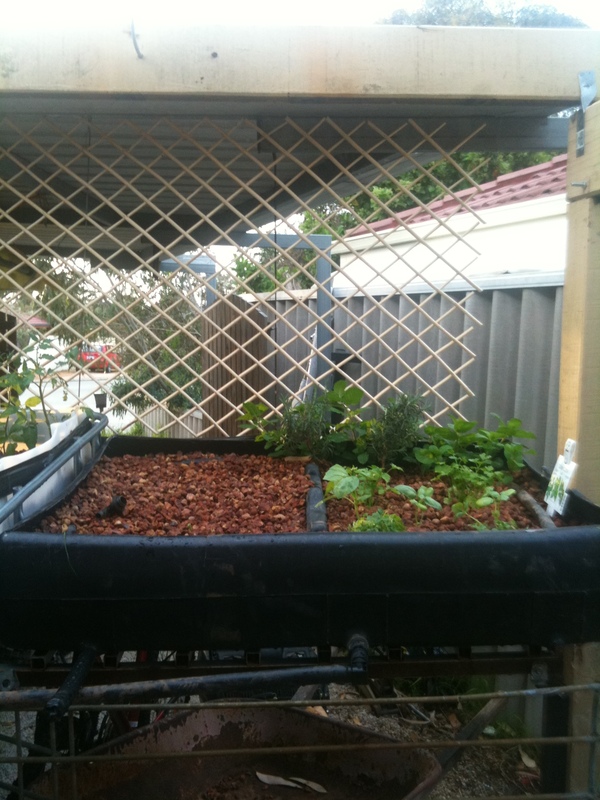 I’ve also added in chives, garlic chives, parsley, peppermint and a few others. We’ve drawn up a list of what vegies we use a lot of and what we should be able to grow, either in the beds, or just in the garden itself. 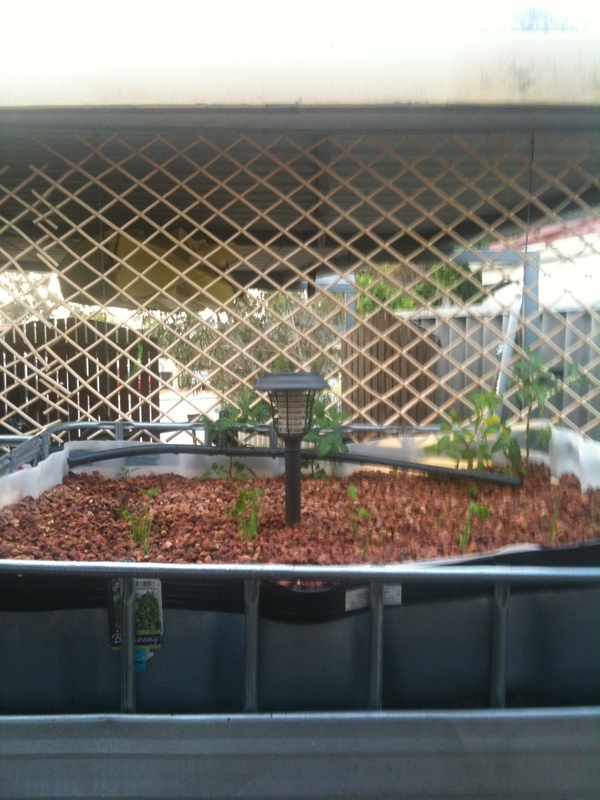 We already pumpkin, cucumber and watermelon planted around the side, but I want to try onions, and maybe asparagus. And in an effort to combat bugs and other nasties, we’ve been looking into companion gardening, so I’m probably going to have to replant my herbs so they are near plants they can assist in some way – no loafing off in my garden! You have to earn your keep. That’s not the end of it either. Our backyard has a potential orchard of fruit trees – apple, mandarin, fig, peach, apricot, white mulberry, loquat, strawberries and some others that I can’t remember. The mulberry is in full fruit atm, and I have taken to freezing the berries as I pick them, the peach and apricot of dozens of tiny little fruit on them, so hopefully we can keep the birds and fruitfly away long enough to harvest them.However, when I learnt what is the most effective thing for keeping fruitfly away, I’ve decided I’m quite happy using sprays. 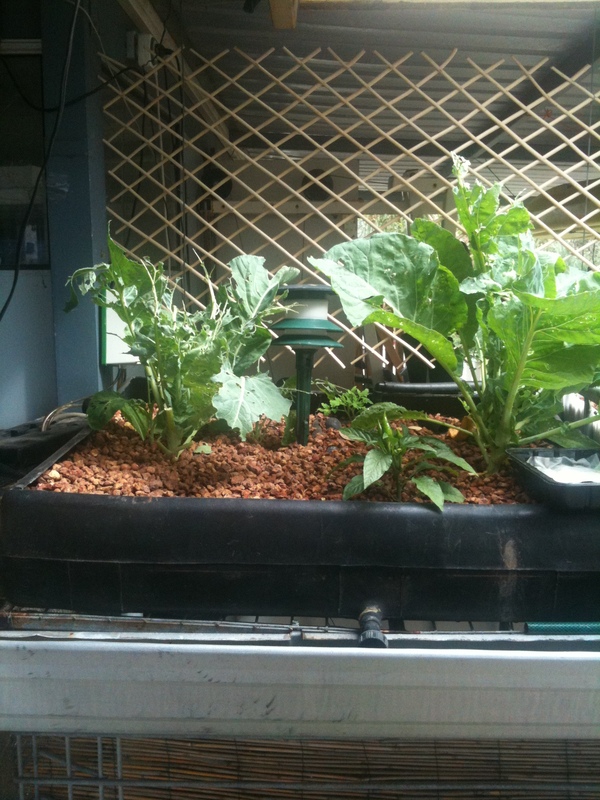 And the fish, well he’s set up two tanks – one with silver perch and the other with a dozen marron. When we bought them, the biggest marron would have been about 5cm long, maybe. Now they all seem to be thriving, and they average about 10-15cm in length. They might still be a way off eating size, but they’re fun to watch at night night time.